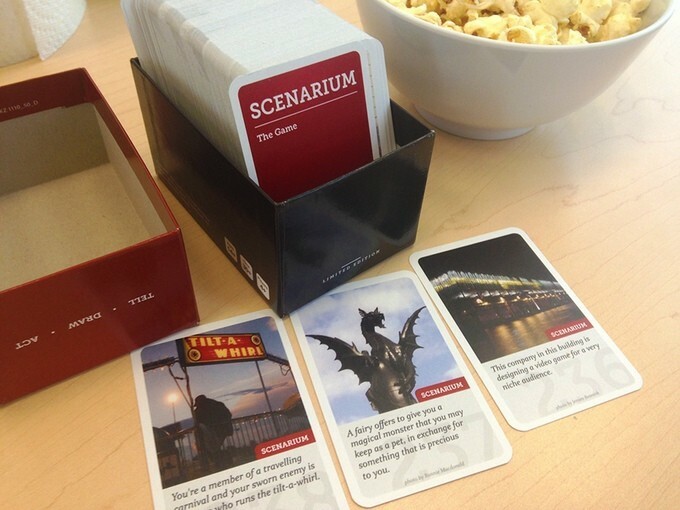 When US game developer Dinosaur Robot Games first approached Cartamundi’s US department, Scenarium was little more than a Kickstarter campaign, and an idea for a party game. The idea was very good, though, so we gladly decided to look into how we could help make it a reality. The campaign eventually gathered 280 financial backers, and Dinosaur Robot Games placed an initial order of 250 sets of Scenarium, a game consisting of 300 cards that challenge players to either tell a story, draw something, or act out a scene. Even with 300 cards in every set of Scenarium, an order of 250 units is still pretty small, so we decided to take the production to our Turnhout, Belgium factory, where we have a digital printer that is appropriate for limited editions. With this first obstacle easily overcome by equipment, the custom packaging that Scenarium required demanded a more creative solution. Although very experienced in packaging design and production, finding a cost-efficient way to design and produce a bottom-lid box for only 250 sets seemed to be a challenge even for Cartamundi. Our packaging designers and creatives didn’t have a lot of leeway to come through on this one, but as their name suggests, they are creative, and, sure enough, came up with a way to meet their usual standard of quality within the budgetary restrictions of a Kickstarter-backed production. For this project, our packaging designers looked away from the drawing board as opposed to starting from it. Instead, looking into Cartamundi’s design archive, they discovered that they could adapt an existing bottom-lid box they had previously designed, as the dimensions of the box were perfect to hold a 300-card deck. Taking this idea further into production, we included Scenarium’s 250 boxes in the much larger order of the original box, and while doing so, more than reached our original goals of cost-efficiency. Scenarium did well right from the release, and only six months after the first order, a second order was placed for 2000 sets. By that time, the party game was listed on several Amazon webshops in the United States, and was gaining considerable momentum. A year later, the demand for Scenarium had already increased tenfold, with a majority of the sales handled by Amazon. 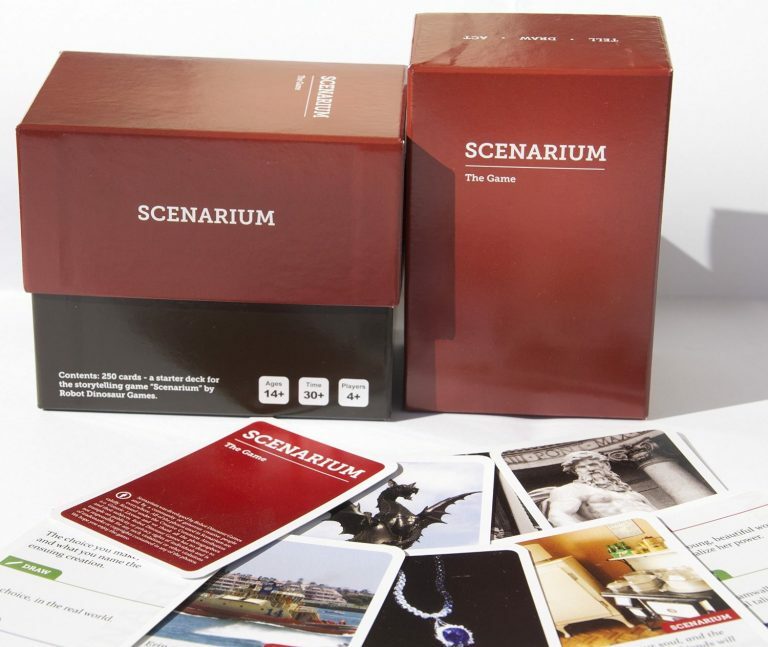 To this day, Scenarium is digitally printed, and packaged in our Belgian factory before being shipped to Cartamundi’s US branches, from where it is then distributed to Amazon’s various warehouses across the country.